Imagine building a school where all the construction materials must fit on a bicycle. 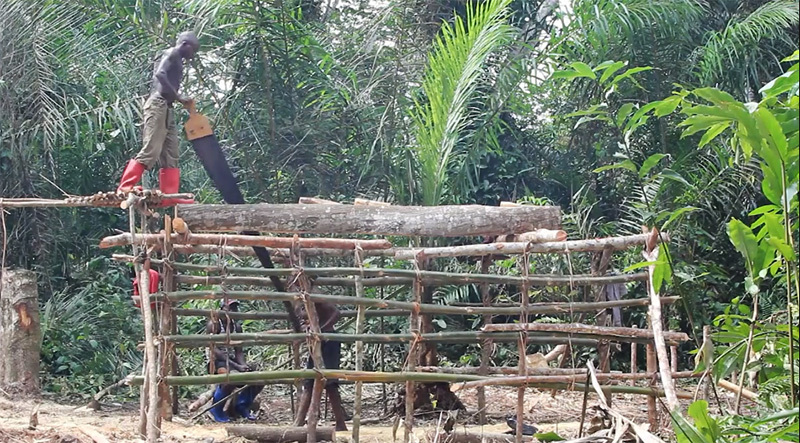 Imagine building without conventional lumber, concrete, or power tools — or, for that matter, no skilled labor, electric service, or running water. Imagine needing to explain even basic drawings to carpenters and masons unfamiliar with construction documents. Imagine having to do that decoding in French. Above: While at UO, “I became very interested in studying more about the social value of building in economically lean communities as well as the value of great design in places that have incredible, painful stories of their own,” Brose said. Photo by Thatcher Bean. Now imagine three plane trips followed by five hours on a motorcycle to get to the building site — and realizing you just need to live there. For a year. To make this school happen. In a rainforest that alternates between pounding rain and oppressive heat, and where the day-to-day needs you’re accustomed to are scant. 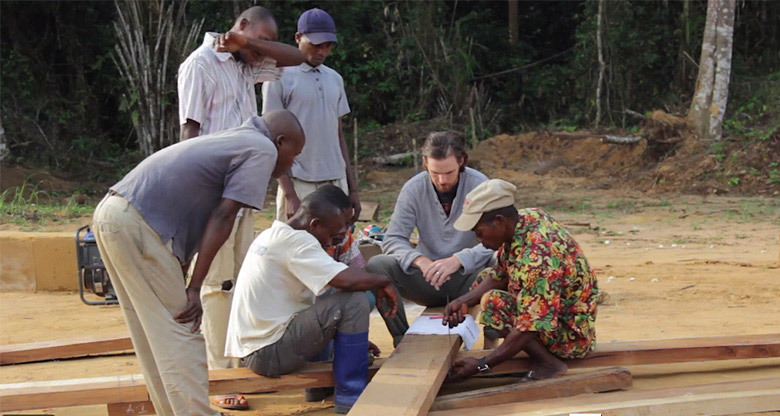 Now stop imagining, and get to know Andrew Brose, BArch ’10, who willingly lived that year in the rural African village of Ilima while overseeing the building project, which was the community’s first school and, at 10,000 square feet, the largest structure many residents had ever seen. The project won Brose and his team a 2016 global award for Excellence in Public Interest Design from Design Corps and the Social Economic Environmental Design (SEED) Network. The annual SFI conference, which began in 2000, “brings together and shares the best ideas and practices that are reaching those currently un-served by architecture,” the award stated. “However, MASS went further … to identify specific and granular needs by participating in a full research immersion prior to the start of the project. MASS’s pre-design immersion included direct observation, individual interviews with community members, and focus groups with the youth. This immersion affirmed the grave need and desire for a conservation related educational facility in the area.” MASS received a $1,000 honorarium for its work and SEED flew Brose from Africa to North Carolina to personally accept the award in March. Ilima lies in the Congo Basin, a region of rainforests, rivers, and wetlands. Years of civil war forced Ilima’s residents — farmers and hunters — to view their environment as a resource to extract a living from more than as a treasure to conserve for future generations of humans and animals and plant systems. They hunted bush meat and engaged in slash-and-burn agriculture to survive. Above: Reaching Ilima takes three plane trips and five hours on a motorcycle. The school Andrew Brose helped design and build is the community’s first school and, at 10,000 square feet, the largest structure many residents had ever seen. For their design of the school, Brose and his employer, MASS, accepted a 2016 global award for Excellence in Public Interest Design from Design Corps and the Social Economic Environmental Design (SEED) Network. Photo by Thatcher Bean. 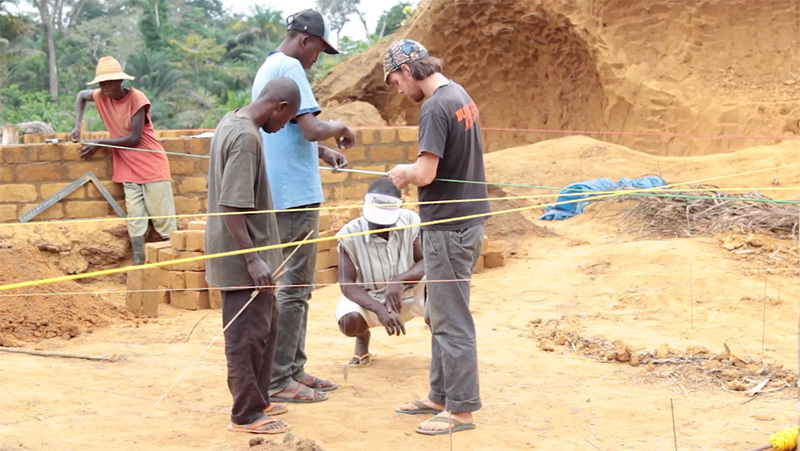 The African Wildlife Foundation (AWF) sought to expand residents’ perspectives by proposing an exchange: AWF would build a primary school in the village — and teach masonry and carpentry skills during the process — if residents promised to stop poaching endangered species and end destructive agricultural practices on surrounding lands. This was a monumental proposition for long-term environmental protection, because the “surrounding land” comprises a mind-boggling 600,000 acres. The village, eager to educate its children, agreed to the exchange. 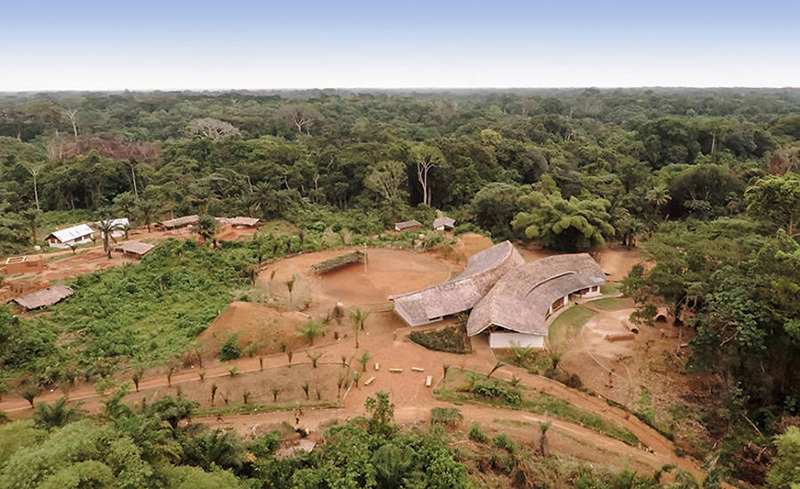 African Wildlife Foundation asked Brose’s employer, MASS Design Group, a Boston-based nonprofit architecture firm, to design and build the Ilima Primary School. 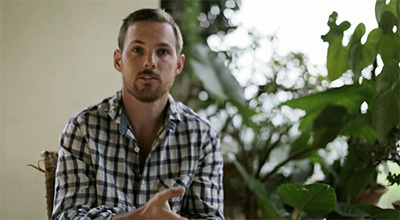 When the request came, Brose, who had moved to Rwanda in 2010, was working for MASS in its Kigali office. 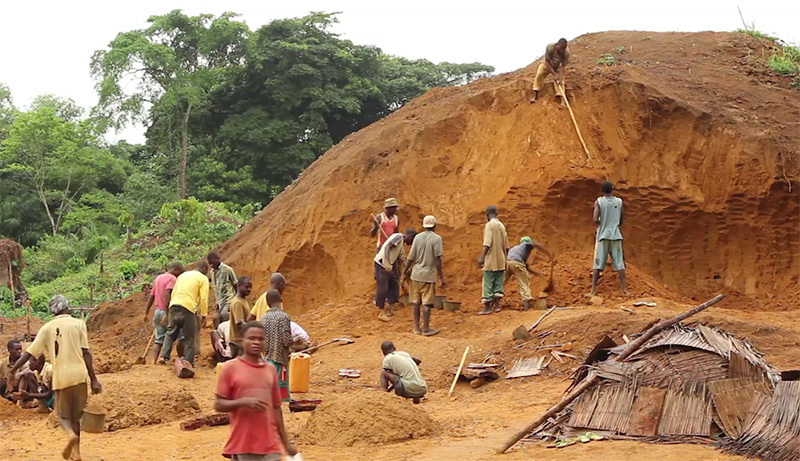 “AWF had approached MASS about designing a number of schools within wildlife reserves and migration corridors, with the intention of improving the conditions of rural schools and teaching young people the importance of conservation of their natural resources,” Brose said in a series of email interviews, first from Congo and later from Rwanda. 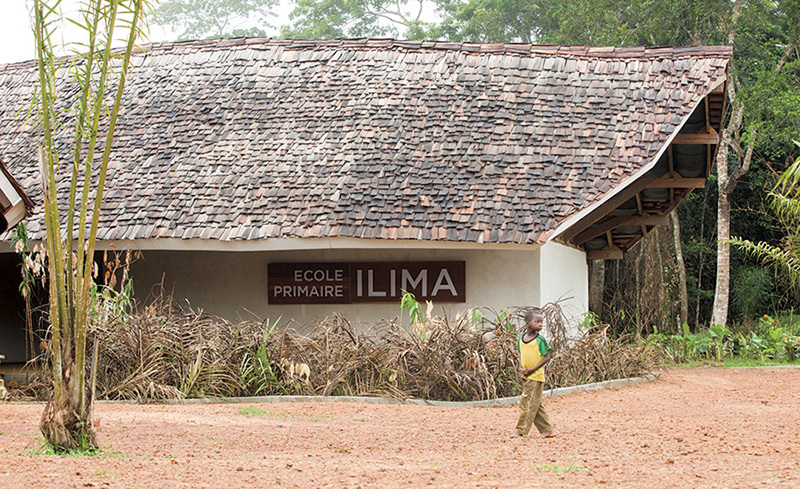 MASS started working with the African Wildlife Foundation on the design of the Ilima School in April 2013. Brose moved to the village in December 2013. Brose brought a uniquely perfect set of skills to the task. “I was asked to manage the design and construction of the Ilima school because I had already spent a number of years on projects in East Africa, speak French, and have an interest in context-appropriate design solutions for extremely remote environments,” Brose said. MASS couldn’t have hired a more appropriate person. When Brose was 15, his family moved from Bend, Oregon, to East Africa for his father’s work with a faith-based NGO based out of Maryland. Brose attended Rift Valley Academy in Kenya, an international boarding school where he played sports and received an “American, college-prep education,” as he puts it, that included fluency in French. Above: Apart from a small amount of materials that came by boat from Kinshasa, most building supplies, including the wood, came solely from locations reachable on foot or bike. Photo by Rachel Brose. In 2005, an internship with World Relief in Burundi as a college freshman spurred his desire to work in “regions of extreme challenge,” he said. His internship involved “distributing building materials to refugees as they returned after the war. I witnessed communities rallying behind families to help with rebuilding their homes, and was excited at how little could be done with a few bags of nails and some adobe brick. With that in mind, during his final year at UO he contacted design firms active in communities facing environmental or economic hardship, eventually discovering work being done by the young group of architects at MASS. Although Brose’s years in East Africa had given him a good understanding of cultural and business differences there, living in Ilima took life challenges to a different level even for him. Other than a few small solar panels, the village had no electricity, and water came only from springs and forest streams. The toughest aspects of day-to-day living, he said, were limited food choices, no electric power, lack of privacy, an unstable political situation, health challenges (he contracted malaria for the first time since moving to East Africa), and battling rural stereotypes about foreigners. Above: Beams were fashioned from hand felling trees, often five and six feet in diameter. 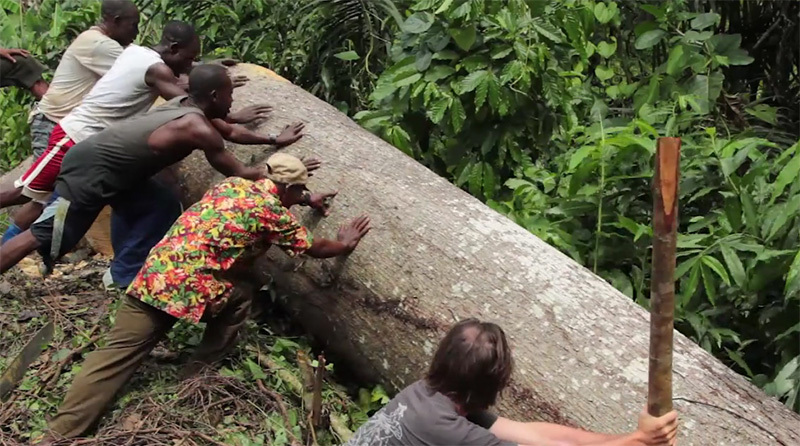 Brose, at right, helps roll the log to where it will be sawn into lumber. Photo by Rachel Brose. Brose’s wife, Rachel, MASS Operations and Media manager during the Ilima project, accompanied him to Ilima to track construction and photographically document each step. While having her there helped him fight feelings of isolation, becoming part of the community was still a challenge. And it wasn’t just that he was American; even his two architecture and design interns, young Africans from the capital city of Kinshasa, struggled to connect easily with locals in the remote village. Time helped. Each brick and plank that brought the school closer to completion helped. The building was designed to serve both as school and community center. The design features two back-to-back arcs facing opposite directions. Three classrooms and a library occupy one section and three classrooms and administration space comprise the second section. Apart from a small supply of materials that came by boat from Kinshasa, most building supplies came solely from locations reachable on foot or bike. Bricks were made from sand and clay taken from termite mounds; the bricks were stacked into walls then slathered with boiled palm oil for water resistance. Hand-cut African Padauk wood shingles sheath the roof, suspended over an open space above the walls to allow breezes to cool the interior. Beams were fashioned from hand felling trees, often five- and six-feet in diameter, then cutting planks using six-foot-long manual cross-cut saws positioned vertically on log scaffolding ten feet above ground. Above: Planks for beams were sawn using two-meter-long manual cross-cut saws positioned vertically on log scaffolding ten feet above ground. Photo by Rachel Brose. Critical to choosing materials was understanding that as the building aged, any repairs would need to be done with locally sourced materials, which meant that options such as a metal roof were out. “If you building something using all imported materials, what happens when that tin eventually rusts out, when that steel is failing, when that concrete falls apart? It will erode and it will turn into a ruin,” Brose said. The building process was informed by “asking the right questions” of the local masons and carpenters and collaborating on the best solutions, Brose said. That also helped villagers gain a sense of ownership and sustainability. Above: Brose lived in the village for a year to oversee the project. Here he works with residents to decide which wood will be used where. Photo by Rachel Brose. The Ilima project defined a passion that Brose brought with him to the University of Oregon, and that his time at UO clarified as socially responsible design. “I took a seminar with [architecture Professor] Howard Davis about creating places of memory after violent or climatic events. From both the visiting lecturers and the topics of discussion during the course, I became very interested in studying more about the social value of building in economically lean communities as well as the value of great design in places that have incredible, painful stories of their own,” Brose said. Above: Andrew and his team check wall levels during the project. Photo by Rachel Brose. Brose also lauded A&AA’s student run design-build group, designBridge, for helping steer his professional course toward socially responsible architecture. What Brose “might be capable of” doing appears limitless, partly because he knows what he wants and isn’t afraid to wait for it. “I graduated during a time when jobs in architecture offices were very scarce. I had a couple of local offers which I had turned down after leaving UO in the hopes of working with a design group like MASS,” he said. 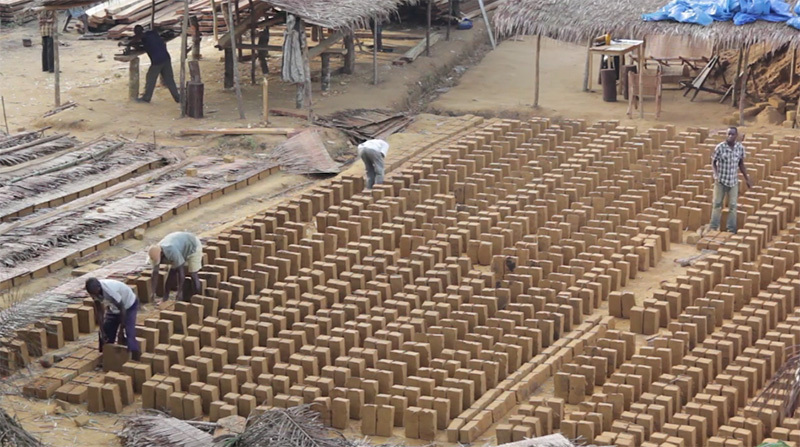 Above: Hand-made bricks dry in the sun. After being stacked into walls, the bricks were slathered with boiled palm oil for water resistance. Photo by Rachel Brose. 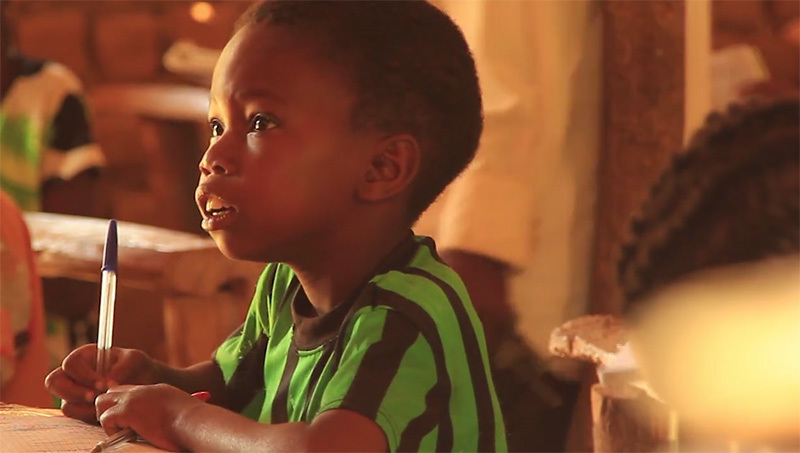 Above: A young Ilima resident concentrates on his lessons. 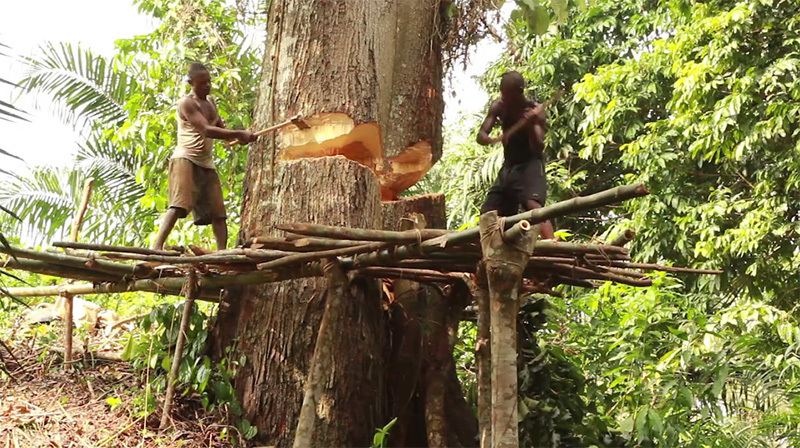 “Making a living in the jungles of [Congo] often entails cutting down trees for charcoal or hunting and selling bush-meat,” the SEED award noted. “To combat this, the Ilima school targets the primary school level and provides conservation education curricula and supplemental training to teachers to ensure students receive a sound educational foundation.” Photo by Rachel Brose. CNN featured the Ilima project in a story January 2015, and Architectural Review reported on it in September 2015. The Chronicle of Philanthropy wrote about the project in November 2014. Designboom covered the story May 27, 2015. This story was published as part of the 100 Stories collection, compiled to celebrate our 2014 centennial and recognize the achievements and contributions of our alumni worldwide. View the entire 100 Stories archive on the College of Design website.